While personal fabrication tools, such as laser cutters and milling machines, are intended for construction, we are exploring their use for destruction. In this paper, we apply this general concept to video games. These games take place inside the laser cutter and end with game objects being physically destroyed. Causing players to irrevocably lose a personal item during gameplay increases immersion and makes each game unique and non-repeatable. Keywords: games; fabrication; laser cutting; destruction, loss. We live in a computer world of plenty and it is getting more plentiful every day. As Moore’s law continues to hold for bandwidth and computer storage, we download and copy, as storing has already de facto become free. And of what we have, we make backups to make sure we will never lose it. Figure 1: Two players are playing LaserPong by controlling panels inside the laser cutter with their rotary knobs. With the recent advent of personal fabrication tools, this trend is now about to begin for physical matter , . According to Gershenfeld , 3D scanners and printers will soon to be found in every home. Users will regularly scan, copy, share, and back-up their physical objects, so as to have more and be save of loss. Or will they? Voonegut explains that almost all stories involve loss at some point , leveraging the experience of loss to create emotion. In many cultures, from ZenBuddhism  to BurningMan  loss and letting go are considered as a means for personal development. In this paper, we explore loss in the concept of physical computer games. We use tools generally intended for construction—but we repurpose them for destruction. All games involve physical destruction of objects as part of their main game mechanics. The concept of destruction and loss has primarily been elaborated on by modern arts, often in the form of games. Several pieces give visitors the choice whether or not to destroy a piece of community property. In Helena  liquidizers serve as an aquarium for living goldfishes, which can be switched on at a player’s will. In Desu100  players can destroy a robot by pushing a button that causes the robot to hit itself with a hammer. The Recovery of Discovery  consists of a pyramid from hundreds of cases of beer; visitors can drink the beer and destroy the bottles. Other games focus on personal loss by requiring players to risk one of their own physical objects in order to play. The video game One Single Life  destroys itself when the player’s in-game character dies, i.e., players lose the game license. Lose/lose  is a spacecraft game in which each alien is linked to a file on the player’s computer; when the player shoots the alien, the file gets deleted. PainStation  requires players to commit their own bodies, which get electro shocked and whipped when they lose. To date, we have implemented three physically destructive games (partially implemented at the time of submission; to be finished by the time of the workshop). As shown in Figure 1, we have repurposed a laser cutter for our implementation. While any subtractive fabrication tool could be used in theory, e.g., milling machines, we have opted for a laser cutter, as it offers a convenient tabletop-like form factor and a clear cover that provides all players with a view onto their personal objects being destroyed. #1 LaserPong (Figure 2) is a pong-like game in which the destructive laser plays the role of the pong ball. In old-school fashion, each player uses a rotary knob to control a paddle with the objective of reflecting the ball back towards the opponent player. If they fail to reflect the ball, the laser continues into the end zone, i.e., the area behind the player, where it destroys the personal item(s) each player had to set down before the game started. Figure 2: In LaserPong the laser plays the role of the pong ball. When players fail to reflect the laser ball, it cuts into the personal object players have deposited, here a five-euro bill. #2 CarSumo (Figure 3) players drive one of their own remote-controlled matchbox cars inside the laser cutter. The laser is perpetually sweeping the playfield in a pre-determined trajectory leaving a trail of destruction. The players’ objective is to push each other into the path of the laser. Pushing the other players’ cars against one of the obstacles on the playfield, increases the chance that they cannot escape the laser. The game ends, when all but one car have been burned by the laser, so as to become uncontrollable. Figure 3: In CarSumo players use their car to push the other player’s car into the path of the destructive laser. #3 LaserNinja (Figure 4) resembles CarSumo in that again all players drive one of their own remote-controlled matchbox cars inside the laser cutter. Every time a player picks up the star-shaped power-up, they get a chance to take a stab at the other players’ cars by controlling the laser for a brief moment. Additional power-ups allow for longer strokes or provide temporary invulnerability. Figure 4: (a, b) Picking up the star power-up in LaserNinja allows that player to strike at the other cars using the laser. To make the moment of destruction a key focus of interest in the game, both CarSumo and LaserNinja are intentionally designed to always give cars a chance. The laser has high power, but that power is finite; it may or may not hit a vulnerable part of the car; the car may die or may have a chance to free itself before the laser strikes again. We implemented all three games using a Universal PLS6.150D laser cutter on top of the code base of constructable . The laser’s ability for real-time use is limited in that sending new instructions takes about ~4s. We circumvent this in the presented games in that they move along pre-computed paths most of the time. LaserPong, for example, pre-computes and uploads the complete trajectory of the ball for a game in which both players always succeed at reflecting the ball, making the game run in real-time. Only when a player misses the ball we cancel the current trajectory (the laser does this in <1s) and send the new path (<4s), which destroys the personal item behind the panel. In this project, we explore the use of a high-powered destructive laser as a means to add real-life consequences to physical games. While the obvious consequence is that it makes game play more thrilling, we also think of it as a mechanism for helping players let go of an object by risking it in the game. We are curious in seeing what objects players will risk. We thank Konstantin Kaefer and Bastian Kruck for their help making constructable  accessible for game development and Pedro Lopes for his help with Arduino. Gershenfeld, N. Fab: The Coming Revolution on Your Desktop–From Personal Computers to Personal Fabrication. Basic Books, 2007. Mueller, S., Lopes, P., Baudisch, P. Interactive Construction: Interactive Fabrication of Functional Mechanical Devices. Proc. UIST’12, 599-606. Ringler, J. and Reckter, H. DESU 100: about the temptation to destroy a robot. Proc. TEI’12, 151 – 152. Willis, K., Brockmeyer, E., Hudson, S., Poupyrev, I. Printed optics: 3D printing of embedded optical elements for interactive devices. Proc. UIST’12, 589-598. The creation and consumption of Christmas cookies is an essential activity during the holidays. For baking cookies one needs, besides the edible side of things, a cookie cutter – or potentially a few of them. They come in many shapes and sizes, however, stars, hearts and similar motives dominate the commercially available selection. Creating custom cookie shapes is typically accomplished using a knife instead of the fixed-shape cookie cutters. The results of this creative endeavour depends highly on the cutting skills of the people involved and are seldom reproducible. So if one wants high-quality, reproducible, custom cookie shapes creating a custom cookie cutter seems inevitable. One of the things that immediately comes to mind is 3D printing the cookie cutter. And indeed, quite a few people have done so already . Also, the idea of building something like a cookie cutter creation tool is not new . However, this tool (and others alike) suffer from the fact that judging the physical dimensions of a drawn shape remains difficult or that their expressiveness is rather limited. This work makes three main points: it presents an easy system to design and build cookie cutters, it demonstrates the idea of using household items for shape input and dwells on the idea of maintaining a close relationship to the real world. Many ways of defining 2D shapes are described in literature. From sketch based interfaces  to more traditional 2D CAD systems . All of those approaches suffer from their disconnection to world they are designing for. It is hard to judge the dimensions and appeal of those virtual artifacts before they become physical reality. Our approach in this work lets the user define the shape using a simple, tangible shape input controller: a piece of wire. Imagine there was something like a “cookie cutter band” that one could bend into the desired shape. Once bent, the shape would be fixed and additional struts would be introduced to strengthen the cutter. That’s exactly what this system does. The user bends a piece of wire into the desired shape and the system constructs a cookie cutter, which is then printed on a 3D printer. planarity: the wire has to be bent flat, much like the cutter itself is going to be. This constraint is also imposed by the application domain, as cookie dough is generally flat. not self-intersecting: a self intersecting cookie cutter would produce cookies which do not hold together as one piece – hence, we require the shape to be a simple polygon. with results as depicted in figure 2,c. The correctly scaled polygons are then extruded into 3D space using OpenSCADs 2D subsystem. Additional struts are added to stiffen the cookie cutter and ease its handling. Strut size is determined by computing the bounding box of the polygon. We implemented this system using simple computer vision algorithms. While this implementation is sufficient in many cases, it is not particularly robust. The paper sheet corner detection does not always work and the whole process depends on proper parameter choice – parameters which are image dependent. A more sophisticated processing pipeline or some form of automated parameter choice could be explored. Also, the line extraction depends on the characteristics of the shape being extracted. While the erosion stage somewhat mitigates this effect, e.g. glossy wires or “sketchy” are still unsuited for this system. Our system does not enforce the constraints imposed by the domain (i.e. simple, not self-intersecting polygon). Users can input such a shape and the system will try to create a cookie cutter from it, regardless if such a cutter makes sense or not. The system could inform the user when a shape is not meaningful and suggest corrections. Future work could investigate the suitability of certain media as shape input controllers. A question that comes to mind is, if it is easier to bend a wire into shape rather than to draw the shape with a thick pen? An investigation of this question should take the tangibility and affordance of the wire *as compared to a drawing on a sheet of paper) into account. Also, the importance of real-time feedback could be explored. Is it enough to get feedback on the producability/constraint enforcement at discrete points in time, e.g. when we feed an image into the system? Or should the system provide continuous feedback? Also, what is the relationship between constraint system complexity and real-time feedback need? In this work, we described the idea of using household items for modeling, specifically investigating wire as shape input sensor and A4 paper as fiducial marker. We implemented a system for designing cookie cutters as case study, targeting 3D printing as production technique. Our system is easy to use, as it is situated in the real world. Tangible user interfaces (TUIs) are, according to Hiroshi Ishii, about “mak[ing] digital information directly manipulatable with our hands and perceptible through our peripheral senses through its physical embodiment”. Although touch screen-based interactions are increasingly popular as smartphones continue to sell, there are still strong arguments for maintaining the tangibility of interfaces: these arguments range from speed and accuracy (a gamer using a gaming console) to visibility (ability of others to learn and interact with one’s data in a shared space) to safety and accessibility (including eyes-free interfaces for driving). We have previously investigated the benefits of tangibility in How Bodies Matter. 3D printing holds obvious promise for the physical design and fabrication of tangible interfaces. However, becasue such interfaces are interactive, they require an integration of physical form and electronics. Few of the early users of 3D printing can currently create such objects. For example, we surveyed the the online community Thingiverse; presently it and sites similar to it show a definite tilt towards objects like 3D scans of artwork at the Art Institute of Chicago. These things are immobile, captured rather than designed, and intended to be used as jewelry or art pieces. A smaller set of things on the site have mechanical movement of some kind, like toy cars and moon rovers. A third, yet smaller, class are things that are both mechanically and electronically functional, like Atari joystick replacements. The users who dabble in this last sector are typically experts in PCB design and design for 3D printing. Many of the objects on Thingiverse focus on 3D printable designs. Aside from 3D printers, other classes of digital fabrication hardware, like vinyl cutters, have also reached consumer-friendly price points. Our group at Berkeley is examining how to combine the capabilities of these types of hardware to assist designers in prototyping tangible input devices, with an eye towards the ultimate goal of making hardware prototypes more like software prototypes: rapidly iterable and immediately functional through tools that are easily learned. We want to use our work to educate and excite high school students in STEM fields. Our first project, Midas, explored the creation of custom capacitive touch sensors that can be designed and made functional without knowledge of electronics or programming skill. These types of sensors can be used, for example, to enable back-of-phone interactions that don’t occlude output while a user gives input; or to experiment with the placement of interactive areas on a new computer peripheral. We even used it to build a touch-sensitive postcard that plays songs and a papercraft pinball machine that can actually control a PC-based pinball game. The Midas video submitted to UIST 2012, describing the user flow and basic implementation of the system, can be found on YouTube. A Midas-powered prototype enabling back-of-phone interactions for checking email. Midas consists of a design tool for layout of the sensors, a vinyl cutter for fabrication of them, and a small microcontroller for communication with them. The design tool takes the drag-and-drop paradigm currently prevalent in GUI development and expands it to hardware development: the designer does not trouble herself with the “plumbing” that turns a high-level design into a lower-level representation for display or fabrication. In a GUI editor this means the tool is responsible for determining pixel locations and managing components at runtime, while in Midas we create vector graphics of the designer’s sensors and appropriate connective traces. In both cases, the designer is free to concern herself with the what rather than the how. Once a designer has completed her sensor layout with Midas, instructions are generated which lead her through a multi-step fabrication and assembly process. In this process, she cuts her custom sensors from copper foil on a vinyl cutter, adheres them to her object, and connects them to color-coded wires. She then uses the interface to describe on-screen interactions through a record and replay framework, or to program more complex interactions through WebSockets. In user tests, we found the tool suitable for first-time users, and we found interest in it at venues like FabLearn, a conference for fabrication technologies in education; and Sketching in Hardware, a weekend workshop for hackers, artists, and academics. However, it has a fundamental limitation: it only assists designers with touch-based interactions. In the larger TUI world, there are many more classes of input to be considered. A Sauron-powered prototype of a controller with a button, a direction pad, a scroll wheel, a dial, and a slider. Continuing our explorations, we have begun a project to enable designers to turn models fabricated on commodity 3D printers into interactive prototypes with a minimum of required assembly or instrumentation. We share a goal with Disney’s work: functional tangible input devices which can be fabricated on a 3D printer without intensive post-print assembly. Our approach involves inserting a single camera into a completed input device print. Our current prototype, Sauron, consists of an infrared camera with an array of IR LEDs, which can be placed inside already-printed devices. The camera observes the backside of the end-user-facing input components (e.g. buttons, sliders, or direction pads), and via computer vision determines when a mechanism was actuated and how (e.g. it can give the position the slider was moved to along its track). This allows designers to create functional objects as fast as they can print them: the only assembly required to make the parts work with Sauron is to insert the camera. Our next steps in this project include developing a CAD tool plugin that will aid designers in building prototypes where all input components are visible to the single camera; the plugin will automatically place and move mirrors and internal geometry to make all components visible within the cone of vision. This again frees the designer to think about the what rather than the how as prototypes come out of a 3D printer essentially already functional. The world is interactive, but most things created using digital fabrication aren’t yet. Through our work at Berkeley, and hopefully our interactions with the FAB at CHI workshop, we are hoping to explore the potential of digital fabrication tools for functional prototype design. 1) Remote real-time teaching and mentoring of excedring makers. Students often need targeted mentoring in areas outside their expertise: for example, computer science students in an interactive device design course may need help from experts in solid modeling or PCB design to review designs and offer critique. By bringing remote collaboration into the fab lab, experts from industry or other fab labs around the world can be called in to help teach new skills and mentor new makers on their projects. 2) Remote design and debugging for manufacture. Small, independent manufacturing companies are appearing at mainstream product shows and, in many cases, offering more innovative products than large traditional product companies. However, these small companies often have less opportunity to visit manufacturing sites to debug design and manufacturing problems. Connecting on-site designers and technicians at the manufacturing site with remote collaborators in the design studio – who may have more design expertise or an understanding of design rationale – can better inform how to develop, debug, and refine a design or manufacturing process. 3) Distributed product companies. Distributed development tools made open-source software possible – they empowered individual programmers to make meaningful contributions to large, complex projects and enabled the formation of geographically distributed development communities. In the world of physical products and electronic hardware, collaborative remote fabrication offers the opportunity for open-source product development. It also opens the potential for distributed manufacturing, allowing companies to locally scale-up production for specific markets. Our research goals are to first understand the unique opportunities and challenges of remote collaborative fabrication; and then to create and evaluate new design and collaboration tools that address these issues. Google+ Hangouts & Events – A hangout is a multi-party videoconference. We adapt hangouts to stream multiple different video streams from the same user simultaneously (e.g., the user’s desktop, a face-to-face view, and a mobile device video feed – see Figure 1). Embedding hangouts in virtual “events” makes it easy to attach static images to such conversations (Figure 2). Dropbox – We use Dropbox for file sharing. Shared files include the design documents themselves, as well as background research and reference information, e.g., tables that list common wine bottle sizes. Figure 1: A hangout session with six video streams, three from Berkeley (highlighted in blue, 1B) and three from Paris (highlighted in pink, 1B), each containing: face-to-face video, screen sharing, and mobile video. Figure 2: Our Google+ Event allowed us to quickly share photos of sketches and prototypes in progress, taken with smartphones. In this first experiment, we started with individual background research; then, via our remote link, we sketched out a few initial designs on paper (Figure 3A); we articulated a design using vector drawing tools (e.g., Adobe Illustrator, Corel Draw); we tried laser cutting physical models (Figure 3B) from a range of materials including paper, cardstock, carton bois, and acrylic; and we eventually tested them in context (Figure 3C). Figure 3: Following a wine rack design from early sketches (A), to the laser cutter (B), to testing at home with the carton bois prototype (C). Conversations about digital and physical designs require multiple media formats. share high-resolution still images of finished prototypes. … and that’s still not quite enough. While all of these different channels are needed to communicate around physical fabrication, management of attention quickly became an issue – both in pulling a desired view from a remote collaborator’s channel, or pushing content to a remote collaborator’s display. Figure 4: Collaboration requires many channels, including a videoconferencing “talking head,” screensharing digital designs, cellphone cameras for impromptu photographs of sketches, an inspection camera to show materials and prototypes close-up, and an of the laser cutter to show fabrication in process. One possible addition is to have a more dedicated, expressive physical presence to represent the remote collaborator in the local fablab. Another concept is to more clearly indicate where the remote participant’s attention is at any given moment: this could also help indicate whether or not they are operating machinery and are, therefore, unreachable for safety reasons. Software. In our experiment, Berkeley could print to the laser cutter directly from Adobe Illustrator, while Paris had to print through CorelDraw. Fortunately, we could exchange common filetypes over Dropbox that could be opened on either end. However, we often needed to discuss and decide upon specific design details – in order to share a common view, we ultimately used screen sharing, gesture around the digital design through mouse movement to refer to specific design elements. Tools and Settings. Local differences quickly appear once we translated digital designs into physical artifacts. For example, Berkeley and Paris each have different brands of laser cutter. The drivers for each of these laser cutters varies significantly: Berkeley’s laser cutter has a more extensive settings list for various materials and material thicknesses. Unfortunately, each machine’s laser is at a different wattage; frequency, power, and speed settings cannot be easily exchanged in order to match one machine’s settings to another. Currently, Berkeley has a 3D printer that uses multi-jet modeling; Paris has plans to acquire a 3D printer that uses cured liquid (SLS). Future collaborative fab labs could share inventories of tools and supplies such that each site has peripheral awareness of joint resources (Figure 5). Figure 5: One way to create awareness of each others’ individual and common resources is to and combine local inventories to identify overlap in a website that is viewable from both locations. This can help identify what can be done remotely (e.g., using local materials) and what can be done at both sites (e.g., cutting acrylic). Materials. Stores in different locales often stock different materials. The variety of locally-available materials also allow for products to be developed that are tailored to the local supply chain, or to test in a wider range of materials than is available at only one location. Additionally, early prototypes are also often created out of cheaper, thinner materials (e.g., paper or cardboard) before moving up to thicker materials (e.g., acrylic). However, slot-construction designs for laser cutters use the material thickness as a design parameter to determine the slot width. One solution to this is to introduce site-specific model parameters into the design tool that automatically adapt the model when a user chooses a local model material and thickness. Scrap also differs in each fab lab; not all projects should necessarily be made out of virgin materials when scrap is readily available. However, this requires each local fab lab to customize shared design files to accommodate efficient use of their particular scrap. Future fab labs may be able to find ways to help designers lay out a design to optimally use local scrap (Figure 6). Figure 6: One way to technology could help designers intelligently use scrap is to scan the material (A), and then use the scanned image (B) to determine the optimal layout for the parts (C). This is simply an initial list of issues discovered in our initial experiments; we intend to continue to experiment with remote collaborative fabrication and flesh out how fabrication practices vary given different collaborative scenarios. We also intend to implement some of the above proposed designs, in addition to others that we generate, and evaluate whether or not they enhance the abilities and experiences of remote prototypers. Lora Oehlberg is currently a post-doctoral researcher at INRIA working on how new technology and interactions can better support for distributed collaboration around prototyping. She has a PhD in Mechanical Engineering from the University of California, Berkeley. She also has an MS from the University of California, Berkeley and a BS from Stanford in Mechanical Engineering. Since starting her post-doc, she has been aggregating a list of prototyping resources local to Paris – namely prototyping supply sources, local fabrication groups and workshops, and a French-English glossary of prototyping vocabulary. This position paper is touching on themes of personalisation, algorithmic design and the relationship between digital information and physical artefacts from a perspective of a product designer and with a view on the increasing accessibility of digital fabrication tools to wider audiences. With a background in product design and only recently having joined the HCI research community, I am interested in exploring the changing role of professional product designers and the process of designing in this emergent era of digital fabrication technology. The design and fabrication of physical objects, which until recently was only accessible to specialist engineers and manufacturers have been opened up to a wider audience. The boundary between professional and amateur or between ‘designer’ and ‘user’ are being increasingly merged. This enables non-specialist users to access, create and share 3-dimensional objects, shifting the focus from mass-production towards mass-customisation, from the design of products to the design of co-creation systems  and algorithmic frameworks allowing the user to generate their own personalized objects. Miller argues that every object in a persons’ home (or the absence of objects) is an expression of themselves (individually or collectively); personal experiences are recalled and embodied in souvenirs and artefacts. Individuals tend to surround themselves with objects that mean something to them and express their lives, personalities or emotions . Petrelli et al define such personal object as memento: “A memento is an object given or deliberately kept as reminder of a person, place or event.” These mementos can take a number of different shapes or forms, from drawings and photographs to handmade or everyday objects, triggering very personal memories and stories. There are numerous generative interfaces online today for the co-creation of personalised products, such as Nervous Systems, Fluid Forms, Cubify and Supabold, but most of them are fairly limited in structure so that the user only has a finite amount of freedom to personalise and create a shape. This process of algorithmic or generative design is the development of a set of mathematical rules that create various unique programmatically generated outcomes of “artworks, three-dimensional forms or architectural propositions”. Research into generative design and co-creation has mainly focused on the design of systems that let users change the shape of the object to personalise it. This research however is developing the idea of co-creation a step further to generate shapes from captured data which is inherently personal and not reproducible (almost like a fingerprint) before the user can access the shape to customise it further. I hypothesise that this additional level of personalisation incorporated into the design process will create a stronger emotional attachment to an object. Creating mementos as physical manifestations of a temporary experience will be explored through capture, visualisation and personal fabrication tools. The following case study is an initial idea or work in progress of how data can inform the design and co-creation of objects and incorporate experiential meaning. Sensors on board of the tidemill were measuring the river’s environment, such as acidity, oxygen, nitrates, salinity and turbidity every 30 minutes (Fig. 2). This data was then used by arduino driven musical instruments that visitors could engage with to experience both the river and sound in a different way. In order to invite other artists, designers, creatives to engage with the data that was collected and broaden the experience for the visitors the artists made the collected data available online through Cosm , a platform for sharing and exchanging data. Below is an example of the 5 data streams combined into one diagram (Fig.3). With my background in product design I explored the possibility of using these data streams to create objects based on temporal change of data. The 5 data streams were used as driving dimensions for the shape of an object. To create a conceptual connection to the river, flow and its data, a vase was chosen as basis for the design of an object. A CAD model was developed of a basic vase shape with its dimensions (diameters and heights) based on the river’s data (Fig.4). The physical manifestation of this temporary information is a form of capturing the experience with each shape representing a different moment in time (Fig.5) and its environmental data as a driving force behind the object. The different CAD generated models were 3D printed in different materials (Fig.6), through printing services such as Shapeways , to compare material qualities. Although new materials for digital fabrication are constantly developed and the quality of materials changes rapidly the currently accessible materials are still of lesser industrial quality than traditional materials and manufacturing techniques. The most suitable material for this instance was 3D printed ceramic which was glazed to make this material food safe as well as water resistant which was essential for this design. These initial prototypes are in the early stages of the development and an interface has not yet been developed. The development of an online interface is the next step. The main feature is the incorporation of different data streams from websites such as Cosm so that the user can copy their data API into the interface to change the input for the generated object as well as then customise the shape, surface or structure further. The object can then be sent to a printer directly, uploaded to a 3d printing service, like sculpteo, shapeways or imaterialise, or shared via online platforms such asthingiverse or social networking sites. The potential of designing objects that are inherently driven by one’s own data or information will create more meaningful mementos and therefore create products with longevity. The vast data that is gathered and captured every day could be used to generate a new type of object. Spatial, environmental or social data are only a few examples of what possible data streams could be used to develop these mementos. By incorporating ones personal information into the design of the object a more meaningful personalised artefact can be developed. The digital interfaces for this personalisation process to generate significant mementos are an important part of the design process. There is also potential to not only create online interfaces but develop meaningful mobile apps that relate to spatial, architectural or environmental experiences. Developments into the creation of 3D objects through mobile devices [2,3] has only been explored more recently but similar to the online interfaces, the systems don’t yet respond to personal or spatial experiences which holds a lot of potential for future explorations. Atkinson, P., 2010. Boundaries? What Boundaries? The Crisis of Design in a Post-Professional Era. The Design Journal, 13(2), p.19. Miller, D., 2008. The Comfort of Things, Polity Press, Durham. Petrelli, D., Whittaker, S. & Brockmeier, J., 2008. AutoTopography: what can physical mementos tell us about digital memories? CHI’08 Proceedings of the SIGCHI Conference on Human Factors in Computing Systems pp.53–62. Sanders, E.B.-N. & Stappers, P.J., 2008. Co-creation and the new landscapes of design. CoDesign, 4(1), pp.5–18. I consider programing to be a method for personal expression. Because I’m a person who writes code and makes physical things, I’ve thought a lot about using code to produce functional objects. What might this process look like and what steps would it involve? You could start by writing a program that generated a variety of patterns. You could then produce a file from one of the patterns that could be digitally fabricated, say on a laser cutter or 3d printer. Through handcrafting, you could then turn the fabricated parts into a finished piece which you could use, wear, exhibit, sell…you name it. The potential end results would be determined by your experience as a programmer, your access to fabrication tools, and your ability as a craftsperson. Algorithmic crafting is the term I’ve chosen to define this process, although components of it exist under other names. Algorithmic crafting combines computational design, digital fabrication and traditional craft to produce functional, beautiful, physical objects. Computational design allows a person to write programs to create and modify form and structure. While often used to determine the structural and functional properties of a piece, computational design can also shape the aesthetics of an object. Digital-fabrication machines provide a means of translating computationally designed forms to physical objects. Ultimately, these machines are used to produce components of a final object, rather than a finished piece, and as a result, provide the opportunity for a third step of hand-construction. Depending on the fabrication material and end project, this construction process can incorporate traditional crafting practices. How does personal expression manifest through programming and digital fabrication? How can the processes of physical prototyping be compellingly linked to digital design and computation in a way that creatively reinforces both physical and virtual modes of working? What are the potential conflicts between craft and computation, and how can they be mitigated? Over the past year, I have worked on developing a variety of software and programming environments to help people create computationally generated, digitally fabricated crafts. I have worked with different groups of people to use these tools in aworkshop setting to produce clothing, accessories and other functional objects. This process has provided some insight into the above questions, as well as generating many new lines of inquiry. I think [programing and fashion] are really interesting but I never thought they could ever be together in one concept, and it’s awesome that I know that now- that you can design aesthetically pleasing things from coding. This level of enthusiasm was common among participants; they all proudly modeled their creations, and many of them wore them home. This behavior suggests a relationship between the decisions made in a programing context, and the participant’s desires to express their visual identity. The participants were selective in the code they wrote to design their garments because they intended to wear the garments, and as a result, be represented by them. This powerful affective relationship between computation, design and self-expression provides a natural way to engage people in programing and design by supporting their personal interests. I think it was really fun that we got to do a prototype first because then if you don’t like it, you don’t feel a lot of pressure because you can make it again really fast, and there’s no stress because if it doesn’t turn out well, then it’s not your final project. The combination of programming, rapid fabrication, and physical construction allowed for a design approach that transitioned from programing to fabrication to programming adjustments based on the fabricated elements, and then back to fabrication. This iterative approach resulted in a closely linked cycle of physical and digital engagement. Conversely, the gap between the participant’s programs and physical artifacts sometimes it difficult to incorporate information from prototyping back into one’s design For the participants in the workshop, direct physical engagement with the materials became an important input to the decisions they made in their programs. For many participants however, it was not always clear how best to implement this input as code. The central role of prototyping in the creative process strongly suggests that future computational-design tools for novices should endeavor to support iterative prototyping. In particular, features that can intelligently respond to the limitations and affordances of specific physical materials and crafting techniques could better inform the design process of the user. Usually [the music] changes because usually I just have an idea of some sort of note thing, like really simple and then from there I kind of in the moment think of what kind of loops I want to make, trying to make a theme for myself. For code I usually have some end thing that I want, like a design, you think of what you want it to look like, and then from there I try to think of parameters you would try to set up to produce a kind of outcome that would be similar. These two processes feel pretty different to me… For code, I usually think about what I want in the very end and how to get to that, but for music I think about it as I go. Contrasting critiques emerged from other participants. One participant reacted against classifying generative processes as a design method. Changing the parameters didn’t always generate the pattern you have in mind. It was more like generating a few semi-random patterns and you choose one that looks good. It is rather a trying-and-choosing rather than designing /making something you planned to have. I think “design” involves “intention” and “planning.” Programming, crafting, and design should be combined in the way that entails prior planning and intentions as opposed to cutting together the semi-random choices, which could be good but I wouldn’t call that design. As this comment indicates, programmatically producing forms through randomness and generativity does not automatically lead to good design decisions. Particularly in the case of aesthetic choices, some deciding factor has to play a role in selecting a design, but the designer’s role in this process is often ambiguous. The debate over the relationships and conflicts between planning and structure, and intuition and inspiration occurs in many disciplines. In the case of computational design and algorithmic crafting the tools themselves can play a role in limiting or supporting the designer in their attempts to make, or break the rules of their design. There are many challenges to consider when combining computation, digital fabrication and craft. From developing tools that better incorporate the process of physical prototyping into the practice of computational design, to examining the role of personal expression and style in creative programing, to evaluating the computational design process itself. 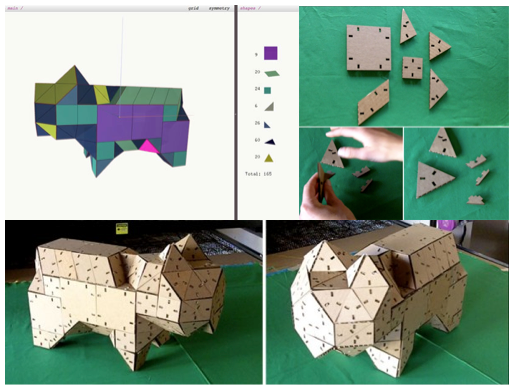 Overall, the continued exploration of algorithmic crafting has the potential to expand the creative applications of programming and support emerging programmers in new forms of art and design. As computational design and digital fabrication become more prevalent in our society, new opportunities to use and understand these tools will become increasingly valuable. Amit: I met my wife Tamar at Bezalel, the Israeli Academy of Art and Design. She was studying jewelry making, while I was working on my Master’s in design. Back then, Tamar specialized in silversmithing, making one-of-a-kind rings using hand tools. Improvising while working, Tamar made unique objects, which I admired, varying from figurative artifacts to abstract shapes. Tamar: When I was making jewelry, I improvised with the material, playing with silver and gold, letting random shapes form into narratives. In 2007, I was working on two rings projects: the first, involving miniature hands, where I used wires to symbolize two hands, almost meeting while embracing my finger (Fig. 2A). In addition, the swan ring was born from the edge of a melted and deformed silver wire, which I shaped into the head of a swan at the top and wrapped around my finger for the body (Fig. 1A). These two rings that were born at the spur of a moment were my favorites. I felt they encompassed a sense of freedom and lightness that sometimes is absent in an over-planed work, and I decided to keep them. Unfortunately, despite my attachment to the rings, I lost them, which I regretted deeply. Due to their improvised nature, any attempt to recreate them failed. So I was certain they were lost forever, hoping that whomever found them would give them a loving home. For more than five years, all I left with were a few photos, taken by my husband. Amit: In the fall of 2011 at MIT, I was in the middle of several projects using 3D printing. I was searching for an appropriate present for Tamar’s 30th birthday, while I was introduced to a 3D printing process by which an element could be printed in wax and then casted by silver or gold. Based on several photos I had of the lost rings, I modeled their shapes in CAD software, searching for approximate identical copies and filling in the gaps from memory (Fig. 1B). I had the models printed, and a few weeks later received two silver rings in the mail, very similar to the original ones (Fig. 1C & 2B). Tamar: I opened the box and I was puzzled to find my long lost rings there. How could this be? They were lost five years ago and a continent away, and yet, there they were. Amit gave me something I thought was gone. In a sense, the lost rings came back to life. They were cloned form their digital DNA, their CAD file, which was constructed form the last remains of the rings: a few photos. Now on, we can re-clone these rings with no extra effort, using the same CAD files. An important quality of contemporary digital fabrication is its accessibility and ease of use in production of virtual designs. While there is nothing new in automation, 3D printing helps re-introduce the concept of personal fabrication: any maker, regardless of handicraft skills, will be able to make objects in his shop or workbench using variety of materials. Digital fabrication and DIY movement borrow narratives from traditional craft, where the intimate engagement between the maker and the produced artifact is central to the fabrication process. A 3D printed work originates from a digital medium, to which it owes its existence. A virtual work doesn’t age in the same way physical work does, and it is always possible to reprint an old, broken or lost artifact (assuming we didn’t delete a digital file). While our 3D printed rings looked very similar to the original work, there was one difference: now we had digital files. The original rings were a hand-hewn physical investment – of time and creativity, captured in the moment, inherently flawed and unique. Today, the digital copies still carry a meaningful narrative, but from this point on the “real” rings are machine-made, infinitely repetitive and reproducible. Considering the meaning of an artifact, the main risk here is that metaphysically the physical instantiation is a meaningless, originating from a timeless and material-less ideal. In contrast, the carefully crafted objects depend on temporal qualities and unique activities: the maker’s personal, subjective investment. I am interested in thinking critically about the how the design of fabrication systems influences one’s ability to use fabrication as an expressive medium. I was first introduced to fabrication in HCI through domain-specific CAD tools that allowed individuals to rapidly build objects using common materials and a laser cutter (Otherlab Computational Design Tools, AutoDesk 123D Make , Sketch Chair). What I find most interesting about this work is the way in which the design and construction leverages the capabilities of computation. These systems support efficient building processes and also add a new aesthetic to the resulting object. A creative space is opening for new art forms and crafts that take advantage of a symbiotic relationship between computation and construction. The production of these new art forms could have the benefit of introducing new audiences to design and fabrication, and supporting educational objectives through fabrication activities. I have worked on two projects that explore different aspects of using fabrication as an expressive medium. The first project, AnyType, focused on the process of composing a digital artwork and investigated how individuals were able to construct meaning and express themselves through that process. The second project, Tangles, allows individuals to design and build 3D models. In the next two sections I detail the findings and insights gleaned from these two projects. I conclude with a few open questions. AnyType is a mobile application that transforms shapes that people identify in their surroundings into a unique typeface. It is designed using the principles of aesthetic interaction, which emphasize engagement and storytelling over qualities like the beauty of the result, speed, and efficiency. To use AnyType, an individual is asked to capture five shapes. Each shape is presented as a frame overlaid atop the device’s camera. The user has to search her surroundings for something to fit into the frame and capture it (take a photo). After the set of five shapes is captured the application uses the captured shapes to create the letters of the English alphabet and presents them to the user. The user is then able to write a message or compose an artwork using her personal alphabet. Through two studies, we observed how AnyType changed the way users related to their environment. The shapes overlaid on the screen caused them evaluate their surroundings in a new context. They began to assign new value to features of their everyday environment such as textures and colors that they had previously overlooked. They thought deeply about how the objects they captured would communicate meaning when arranged into a typeface. As a result, users were surprised at their ability to capture and express their emotions using the application. The process of producing typefaces and compositions led them to reflect upon themselves and create new kinds of artworks, which they had pride in. A full description of the system, study, and findings can be found in the paper AnyType: Provoking Reflection and Exploration with Aesthetic Interaction (CHI 2013). AnyType focused on the way in which individuals navigated an artistic process to create objects of self-reflection and self-expression. Though the process we studied focused on the production of a digital artwork on a mobile device, I believe some of the same design principles could be applied to interfaces for fabrication. This is especially the case if the goal of those interfaces is to allow individuals to express themselves through the production of physical artworks. The AnyType study shows the power of using the capabilities of the device to inform interaction instead of attempting to mimic actions from other mediums (i.e. drawing, painting). It highlights the important role that the process of production plays in allowing individuals to develop a voice within a medium. The process changed the way the individual saw the objects around them and as a result gave them the ability to transform their unique point of view into artworks that served as reflections of their lives and emotions. The Tangles project falls under the umbrella of what Resnik calls a “computational construction kit.” I completed the project as a summer intern at Otherlab in San Francisco. The goal of Tangles was to design an algorithm that could take any 3D object as input and generate an approximation to that object which could be physically constructed out of three kinds of triangles (right, equilateral, and isosceles). In designing the algorithm, I found beauty in the different ways objects could be approximated using geometric shapes. The style of the objects created using only triangles began to mimic trends I was seeing in the design world (Annika Frye, Elisa Strozyk, Phil Cuttance). I designed and implemented a user interface that gave the user control over the input into the algorithm by letting them move the model against a background grid, specify planes of symmetry, and design their own geometric shapes by merging existing shapes together. The program could export a cut-file that specified the paths for printing the parts needed for construction. In our experiments with Tangles, we build models out of cardboard, which was cut into pieces by a laser cutter. Additionally, the user interface was able to display a series of construction steps to aid the user in building their model out of cardboard. While a formal evaluation of the Tangles system was not conducted I did receive informal feedback from artists and educators about the system. The strength of the system in the eyes of educators was the ability for students to input any model they desired into the program and then physically construct it using a standard set of parts. The process of modifying and customizing the model was seen as something that could increase the individual’s connection with the object. The project seemed to dovetail nicely on themes of “Construction and Ornamentation” and “Construction as Personal Expression” outlined in Eisenberg and Buechley’s Pervasive Fabrication: Making Construction Ubiquitous in Education. There seems to be a dominating opinion in fabrication in HCI literature suggesting that when certain constraints are removed by technology, the individual is better able to focus on being creative. From my own experience and observations with AnyType I find constraints to be the defining characteristic of any medium for expression. The relationship between constraints and creativity is complex and future research could shed light on the connection between what is constrained and how the user navigates such a constraint. One possible study may look at how constraining of different features in a CAD environment affects the way in which individuals create objects and how they connect to the resulting object. I also am interested in thinking about the way in which personal expression through fabrication can be explored more deeply in the context of STEM / STEAM education. Rather than thinking of personal expression as the ability to customize or ornament an object, what might be gained by looking at personal expression as a relationship to a particular art-making process? How could a relationship to an art-making process motivate students to investigate certain mathematical or scientific problems? Many of our visions of the future of fabrication are focused on utilitarian applications: how home fabrication allows people to rapidly iterate prototypes, to easily replace damaged parts, and to facilitate hands-on learning and create communities of Makers. While all of these are valuable applications, we believe that home fabrication technology isn’t just a powerful tool: it’s also a medium. Cory Doctorow’s novel Makers explores a potential near-future of the Make movement in general, and 3D printing in particular (http://craphound.com/makers/download/). In a not-too-distant future, an economic downtown has created rampant unemployment. Two genius tinkerers, Lester and Perry, help create an era of “New Work”, where rapid fabrication techniques allow for fast-paced innovation and creativity. Small, local collectives of Makers create scads of crazy new inventions and throw them on the open market, knowing at least one will succeed and fund the next cycle of innovation. “New Work” is fun and successful for about a decade, but eventually its bubble pops under the weight of lawsuits, knockoffs, and poor business decisions by the not-business-inclined inventors. As a lark, Perry & Lester build a “ride”, a golf-cart navigable theme park depicting the glory days of New Work, highlighting all the wacky inventions of those years. Over time, the ride becomes crowd sourced as people contribute new items to it and vote on what should and shouldn’t be included as they ride through. The next innovation comes when Lester suggests “franchising” the ride, by opening new locations across the country. Networked together online, armed with 3D printers and small assembly bots, each ride is updated nightly with new additions and rearrangements. Narrative and evocative scenes start to appear instead of just collections of objects and are replicated across the country. Everything seems great until pieces of a recently-dismantled Disney attraction are “contributed” to the ride and Disney cracks down, suing for copyright infringement. While legal (and physical battles) are waged, a Disney executive named Sammy comes up with an idea inspired by the ride’s use of 3D printing and robotics: Disney-in-a-Box (DiaB), a Disney-made 3D printer that produces miniature versions of the park attractions, assembled by small robots in people’s homes. Each day a new miniature set is released and printed using Disney’s proprietary printers and proprietary “goop”. This is a compelling encapsulation of the ethos and politics of Making. However, it is here that Doctorow shies away from one of the most compelling ideas in the book. Throughout Makers, Doctorow champions emergent meaning: he cultivates a political stance in which outsider communities built on ingenuity and appropriation are morally superior to mainstream consumer culture. A narrative can be found within the ride, but it is explicitly an emergent, non-authored one, coming out of the “collective unconscious” of the Maker community who builds it piece-by-piece, vote-by-vote. Bottom up phenomena like the ride and hacked replicators are shown to be superior to the empty corporate-entertainment-complex embodied by Disney. In this regard, he is faithful to the values arising in contemporary Maker communities. But by characterizing (and valorizing) replication technology as a tool, Doctorow is ignoring a much more interesting role for this technology. Relegating the DiaB to the status of tool is like relegating a book to being only an instruction manual and not a novel; it is like saying that computers are only good for engineering, math, and science but not art, games, or communication. The core insight of Doctorow’s Disney in a Box example is that the objects that it creates carry meaning: that it is a system for telling stories. The fabricators he envisions regularly produce new models for their users: models that convey a story designed to be communicated and distributed through the medium of fabrication. Networked fabricators can be used to syndicate material objects: to communicate stories through material objects. When viewed in this light, 3D printers are not just a tool: they are a new communications platform. Understanding 3D printers, laser cutters, and home milling machines as communication technology is a profound leap away from the utilitarian and towards the playful and the aesthetic. This is a critical step in the evolution of home fabrication, in the same way that playful and artistic uses of computers were critical to the growth of personal computing in the 1970s and 80s. While Makers, hackers, designers, engineers, and artists already have a myriad of uses for home fabrication technology, it is still hard to make a case for the everyday use of these devices among the general public. This parallels the ways in which early computers were of critical importance to scientists, mathematicians, and engineers, but of little use in the home. The powerful number crunching capabilities of computers could not drive a consumer market, but the development of desktop publishing, digital games, graphical user interfaces, and networked communication expanded the role of the personal computer in the home by transforming the number crunching machine into a platform for communication, creativity, and entertainment. 1. 3D printers as household appliance: In order for 3D printers to spread beyond hackers and hobbyists they need to become cheaper and easier to use and maintain. Fortunately, this appears to be happening already. The same cannot be said for laser cutters and other more industrial fabrication solutions (such as lathes and C&C mills). In our imagined future 3D printers and other fabrication technologies are common, affordable, and well on the way to ubiquity. 2. Closed loop between “feedstock” and “product”: One factor that limits the usefulness of 3D printers is that they require raw feedstock in various materials and colors to produce objects. Over time the cost of this feedstock can exceed the cost of the printer (similar to the cost of cartridges for ink-jet printers). Further, one drawback of ubiquitous 3D printing is a potential proliferation of fabricated “junk” in people’s lives. Unlike data (which can be accumulated without any meaningful material footprint in the home) fabricated objects take up non-negotiable physical space. If we wish to use fabrication as a communications platform, we must solve both of these problems. To do so, we envision an integrated recycling solution (similar to the Filabot: http://filabot.com/) that closes the loop between input and output by allowing us to fuel our replicators with household waste and previously printed objects. 3. Wider range of printable materials and colors: As 3D printing has evolved, the technology has moved from the slow creation of low resolution plastic parts to systems that can print in metal, ceramic, paper, and other materials, at high resolutions, often very quickly. In the last year, the MakerBot “Replicator” has evolved from a single to a dual extrusion system capable of printing multiple colors of material simultaneously. In our envisioned future scenario we extend this trend to imagine home 3D printing with a wide spectrum of simultaneous colors and materials. These three advances set the stage for our scenario, as we try to imagine some of the new applications for home fabrication as a communications platform. It bears mentioning that much of our work is on the uses of objects to tell stories, so we naturally thought along those lines in this context as well. (http://thegeekmovement.com/blog/?p=69) Imagine that instead of downloading an e-book version of a story, you download an encrypted set of instructions for your 3D printer. You run the program, and slowly, each object takes shape before you, like an artifact in an archaeological dig site, being carefully revealed. These objects are a material record: a collection of artifacts pregnant with narrative meaning. You pick them up, and turn them over in your hands, looking for a clue about where to begin. Each object triggers a fragment of media playback associated with it (for our The Reading Glove project we used RFID to accomplish this, but it could be done with fiducial markers, camera vision, or a host of other technologies). As you play with the objects, you find yourself embodying a character in the story, who also interacted with them. Some of the objects have particular physical affordances, inviting embodied interactions that communicate meaning by evoking muscle memory and somatic awareness. Others combine to form new objects, which unlock hidden narrative content. We can take this scenario even farther. In Makers, Doctorow has Disney selling subscriptions to a “model of the day” that prints out each morning, enthralling children as they try to figure out what it will be. We can imagine a scenario where the 3D printer is part of a much larger media ecosystem: where the objects it produces are a small part of a much bigger experience that spans digital games, traditional narratives, and physical play. This scenario is inspired in part by the success of the Skylanders system, which uses a combination of action figures, digital games, and collectible cards create an experience that extends into both the physical and digital realms (http://www.skylanders.com/giants/whatyouneed-new). The core conceit of this system is the “Portal of Power”: a near field communication device that is used to “teleport” the action figures into the digital game. Each figure has its own onboard memory, allowing players to develop them through play on their own game consoles, or in collaboration/competition with their friends. At least partially in response to the success of Skylanders, Disney has recently announced “Disney Infinity”: a game using the entire Disney catalog of intellectual property, that combines augmented physical toys and a large, Minecraft-esque, virtual world (https://infinity.disney.com). For our scenario, we imagine a serialized story with a weekly release schedule. Every Sunday afternoon a new model is released, and immediately pushed out to the printers of all subscribers. This model might be an action figure of a major character in the story, or a piece needed to solve a secret puzzle at the end of the previous week’s episode. This is a black box: you don’t know what the model will look like until it is printed. Subscribers get preferred access to the models, while non-subscribers have to wait for (or pirate) their copies later. Having the model gives you additional capabilities needed to succeed in the next level of the digital game, and the models are cool toys in their own right. On Monday the week’s new episode is broadcast, both as a television show, and as a new playable component of a digital game. This new episode incorporates Sunday’s printed item in some meaningful way, providing the subscriber with a tangible piece of the narrative world that is also a key to deeper levels of the narrative and the game play. In this scenario, the 3D printer and its objects become part of a broader set of interlocking narratives and interactions. It becomes another channel for communicating information about the story, as well as a means of rewarding and reinforcing players in the game. Storytellers might use this to build suspense, by releasing a mysterious artifact, or an innocuous seeming object that takes on narrative significance. Storytellers can foreshadow important moments, or create a series of interlocking objects that slowly interconnect to reveal additional narrative information over the course of a season. But we haven’t yet incorporated one of the most powerful and unique affordances of home replication: the ability to customize physical objects to the particular user’s preferences. Now let’s imagine a version of the above scenario where you download an action figure, and it has a face that you designed, or is wearing an outfit that you selected, or is even a miniature version of yourself as a character in the story. Or perhaps your participation in this system allows you to craft a profile of your own preferences. Personalization means that you can participate in a shared media experience, but that your participation reflects something about you. So perhaps you and all of your friends have subscribed to the same story, but each of you receives an object that is slightly different and tailored to your preferences. This scenario begins to explore the possibilities of 3D printing and home fabrication for purposes beyond the utilitarian. We hope that visions like this one will help to shape our understanding of the role of home fabrication as the technology matures. We look forward to a lively discussion on this topic with workshop participants at CHI, and in the larger field.